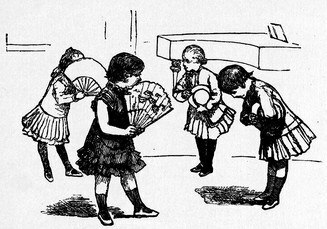 A group of four young Victorian children practice their dancing in the music room. As the girls strike a charming pose behind their fans, their partners bow to them. This is a wonderful picture for anyone looking for dancing children or music related images. Use this image alone or in combination with the picture of the children performing what they have learned for friends and family at a formal recital – the recital. Harrison Weir (1824-1906) created so many of the wonderful illustrations that appeared in children’s books, including this one from The Christmas Tree from 1885.